Don’t miss the breathing romance possible at Dubai dhow cruise. Dubai cruise have that perfect romantic evening you have always dreamed of. The romantic moonlight in open sea, the five star dinner, glamorous belly dance show and your favorite drinks, we ensure everything up to the five star standard so that you may live in your dream. We makes it all possible under this dhow cruise deal. 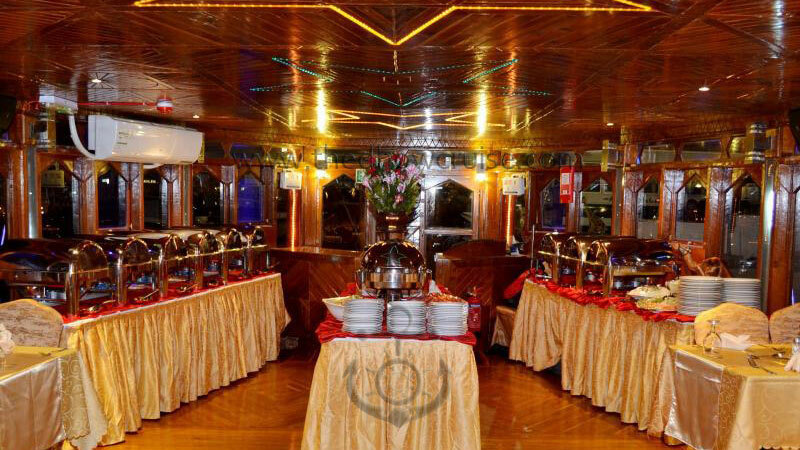 Get yourself reserved for the endless romance in Dhow Cruise Dinner, we offer. Booking procedure is too simple, you just have to drop a call or email us with your name, date of dubai cruise tour, pickup location and number of people. On the day of tour our driver will pick you from your place if you are located in Dubai. For payment you can pay us through credit card, cash and as well as we have online payment system. This dhow cruise deal takes place in the Dubai Creek, called as old Dubai, even old Dubai will fascinate you like new one. During the trip you will pass by several landmarks of Dubai Creek from Dubai heritage village “best place to see the heritage of Arabs, including home of King of Dubai” to the modern Rolex Towers. We also offer tanoura dance and magic show on the Dhow Cruise Dubai.